Tales of feral children brought up in the wild have long been popular. While the best known are fictional (from Romulus and Remus to Tarzan or Mowgli) there have been many well-documented cases over the past few hundred years, and children are still occasionally found in such conditions. One case, however, involved the courts of Hanover and Great Britain. 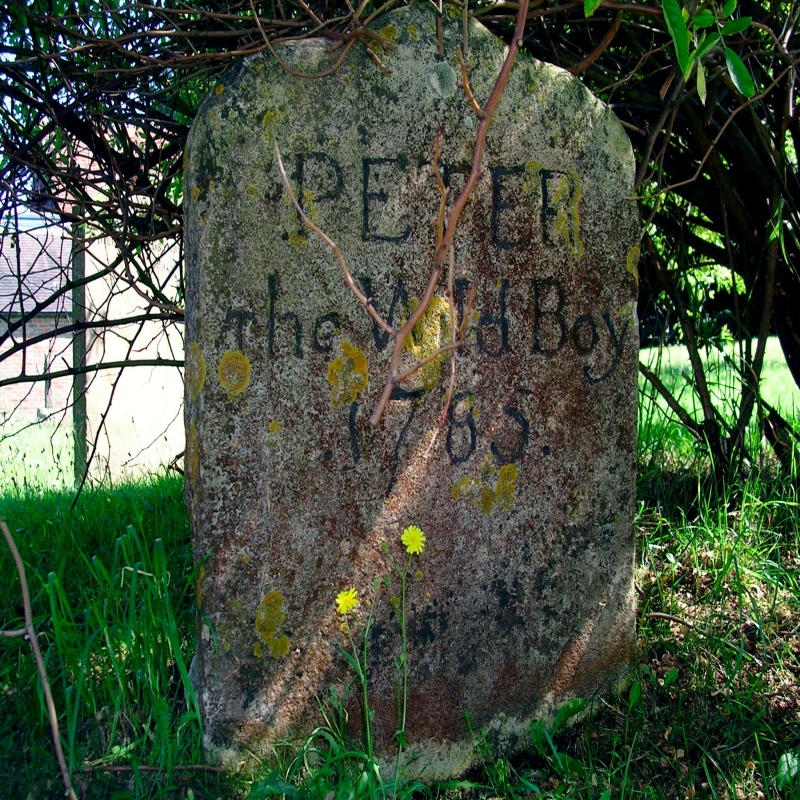 The story began in Germany and took in London and Norwich, but the place that eventually became home to Peter the Wild Boy was in Hertfordshire. In the year 1725, he was found in the woods near Hamelen, a fortified town in the electorate of Hanover, when his Majesty George I with his attendants, was hunting in the forest of Hertswold. He was supposed to be then about twelve years of age, and had subsisted in those woods upon the bark of trees, leaves, berries, &c. for some considerable length of time. Other accounts, however, speak of the child being found and put in the local “House of Correction”. Word reached King George, who was staying at his nearby palace of Herrenhausen, and Peter was brought before him. As Hamelen was a town were criminals were confined to work upon the fortifications, it was then conjectured at Hanover, that Peter might be the issue of one of those criminals who had either wandered into the woods, and could not find his way back again, or, being discovered to be an idiot, was inhumanly turned out by his parent, and left to perish, or shift for himself. Peter was put into the care of a Dr Arbuthnot, who had him baptised and attempted to give him lessons. This was largely unsuccessful, although Peter did manage to learn a handful of monosyllabic words. Interest in the Wild Boy, however, wasn’t restricted to simple freak-show staring. This was an era when thinkers were attempting to understand our place in the universe in a more rational way than before, and the presence of “unaccommodated man” raised many questions. For instance, if Peter couldn’t speak, did he have a soul? Was he a noble savage, or just a beast? Literary figures such as Daniel Defoe and Jonathan Swift entered the debate, while the satirists used Peter to lampoon polite society. Peter was passed from Dr Arbuthnot to one of the Queen’s attendants called Mrs Tichbourne. She left him in the care of a Northchurch farmer she knew called James Fenn, who lived at Axter’s End. After James’s death, he moved to the nearby Broadway Farm, under the care of James’s brother Thomas. He had a much quieter life in Hertfordshire, though curious visitors still occasionally called to see him, such as the novelist Maria Edgeworth. By this time, Peter had learnt to walk normally and, though he appeared to be happy with Mr Fenn, he would often wander away. On one occasion, in 1751, he vanished completely, and a reward was offered for his safe return. PETER, the WILD YOUTH, a black hairy Man, about five Feet eight Inches high, he cannot speak to be understood, but makes a kind of humming-Noise, and answers in that manner to the Name of PETER. Whoever will bring him to Mr. Thomas Fenn’s, at the Place abovesaid, shall receive all reasonable Charges, and a handsome Gratuity. Peter was returned to Broadway, where Thomas Fenn took the precaution of fitting a leather collar to him with his name and address inscribed. While this might seem demeaning, it’s probable than Fenn meant it as a kindness, to ensure Peter’s safety. Peter was described as “exceedingly gentle in his nature” and particularly fond of gin, onions and watching fires. He always enjoyed being outdoors, especially on starry nights, and in autumn would steal away to the woods and eat acorns. Perhaps he remembered his life in Hertswold Forest with nostalgia. Peter lived to about seventy, in the care of various people. In old age, he was described by Maria Edgeworth as looking like a bust of Socrates, and by the philosopher James Burnett as having a healthy complexion and a full white beard. He could still only say a few words, including his name, but appeared to understand what was said to him. It’s said that, after his last carer, a farmer called Brill, died, Peter “refused food, pined away, and died in a few days”, on 22nd February 1785. He was buried at St Mary’s Northchurch, where flowers still periodically appear on his grave, though no-one’s sure who puts them there. The nature of Peter’s condition has long been a matter of debate. 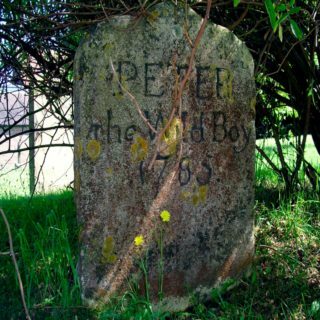 In some such cases, inability to learn language might be put down to not being exposed to it till an age where the ability has atrophied, but evidence suggests that Peter hadn’t been living in the wild for very long. He clearly had some kind of learning disability — or, as the parish register account less kindly puts it, he was “an idiot”. A few years ago, historian Lucy Worsley and Professor Phillip Beales of the Institute of Child Health made an in-depth analysis of his condition, based both on contemporary descriptions and evidence from various portraits, and came up with a diagnosis of Pitt-Hopkins Syndrome. This is a rare genetic condition that can have profound physical and mental symptoms. Besides his very obvious learning disabilities, symptoms of Pitt-Hopkins that seem to match Peter include coarse hair, drooping eyelids and a pronounced “cupid’s bow” mouth. 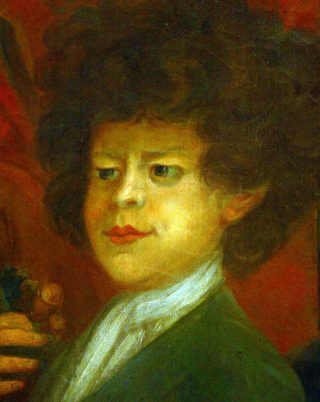 In addition, one portrait seems to suggest that two of his fingers were fused together, another characteristic of the condition. Today, Peter still wouldn’t have been “cured”, but he might be treated with more understanding and helped to make the most of what he could achieve. On the other hand, for an “idiot” in the 18th century he was fairly fortunate. Though treated as a freak in Hamburg and London, he was at least well cared for, and in Hertfordshire he seemed to have had a happy life with people he was genuinely fond of. This page was added on 10/04/2019.